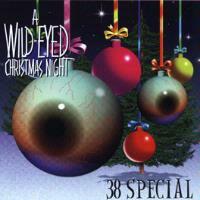 When you think of Christmas music 38 Special is not really a name that pops immediately to mind. It might after you hear this CD. The group has cut loose with their take on holiday music, and it is quite an effective collection. The album balances several things. First it represents a balance between traditional and new, original material. Next the disc seems to strike a balance between a classic 38 Special sound and a more raw rock and roll edge and an authentic Christmas sound. In a perfect world, though, the group would have chosen a different cover. The image gracing this one ties in with the title of the album, but truly is quite ugly. Still, the music definitely makes up for that. This is a great updating of the rock and rolling Xmas classic. The group does a fun, fast bouncy rendition. The southern flavored guitar solo is especially effective. What a great way to start the album! This one is quite intriguing. The group starts it with southern rock twang, but quickly drop into a fairly faithful rendering. Starting with a great, nearly techno beat, as the song proper comes in it feels a bit like a southern tinged ballad that one might here from someone like Garth Brooks. As it carries on, harder edged stylings begin to take control. The cut is quite effective. A down home scorcher, this is a Christmas cut in typical 38 Special fashion. This is a great rocking ballad that really works. This is definitely one of the strongest cuts on the disc, and arguably one of the strongest the group has ever done. With a solid rock and roll sort of groove, this one is off and smoking. This is a slightly countrified balladic song of longing for Christmas past, specifically one when a now deceased Mother was still there to share it with you. The guitar solo on here is particularly tasty. This is a good blues rocking Christmas stomper. Features some hot guitar work. Another holiday traditional cut, this one is done pretty faithfully. It gets powerful as it carries on. The multilayered textures really makes for a killer cut. With a cool acoustic style, this cut is quite pretty and potent. This instrumental gets very powerful.